Earth is a memory worth fighting for. It's almost time. In theaters everywhere next weekend is Joseph Kosinski's Oblivion, starring Tom Cruise, his sci-fi follow-up to Tron Legacy. One of the most exciting parts about it is M83's soundtrack, which was released in full earlier this week. To compliment some of the posters and other art for the movie (like this IMAX poster), Mondo commissioned designed Kilian Eng to create art for their vinyl release of the soundtrack and it's beautiful. Modern Vinyl has posted Eng's art with details on the sale of the set in a few weeks. This is almost worth buying for the art alone. Check these out. 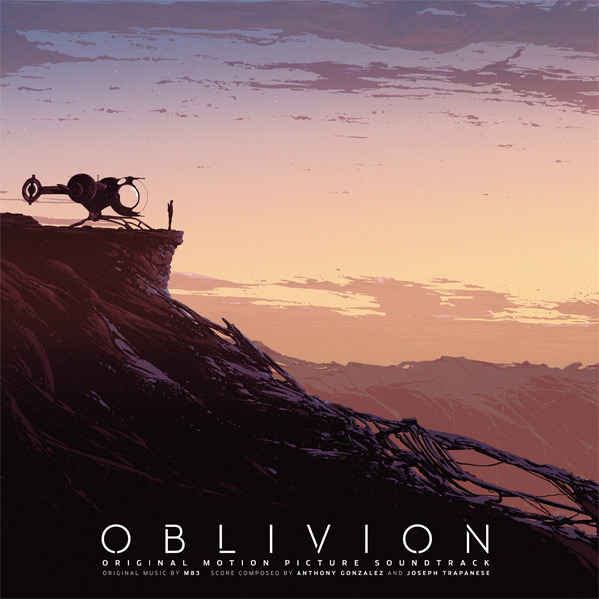 The vinyl version of the M83 Oblivion soundtrack will be available for purchase on April 26th, through Mondo, so follow @MondoNews for updates. It will cost $25. You can stream the soundtrack online here. Kosinski's Oblivion (also known as Horizons) stars Tom Cruise as Jack Harper, plus Morgan Freeman, Olga Kurylenko, Zoe Bell, Andrea Riseborough, Melissa Leo and Nikolaj Coster-Waldau. Living and patrolling the breathtaking skies from thousands of feet above, Jack's soaring existence is brought crashing down when he rescues a beautiful stranger from a downed spacecraft. Her arrival triggers a chain of events that forces him to question everything he knows and puts the fate of humanity in his hands. Kosinski has developed this for years, with a writing credit along with William Monahan. Universal Pictures currently has Oblivion scheduled to open exclusively in IMAX theaters on April 19th. See the trailer here. I love how they're hyping the isolation aspect of this film. It's as if the world were an abandoned amusement park and you can see anything you want without waiting in line or being bothered by tourists. That second one is AMAZING.